Photo by Alexandra Blouin Morgan Cox cultivating trouble as Seymour in Little Shop. With the changing weather and darkening skies, October in Humboldt is well suited to those who relish turning their attention to gruesome subjects, culminating in the finale on Oct. 31, a last gasp of frolicking about before those other holidays start in earnest. 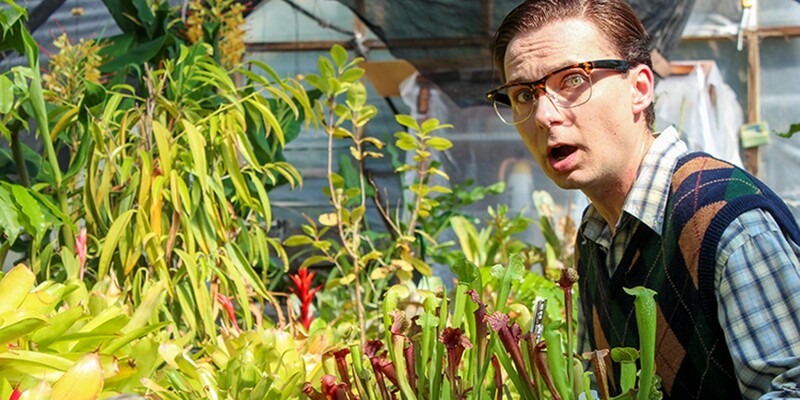 If that's you, enjoy yourself while you can and go see The Little Shop of Horrors at Ferndale Repertory Theatre under the direction of Alexandra Blouin. You won't be disappointed and you may just be a little bit horrified, but in a fun way. 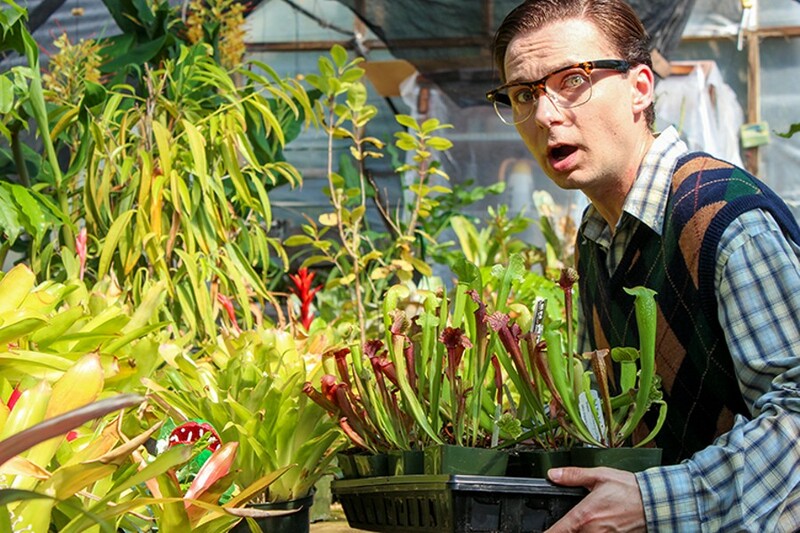 The Little Shop of Horrors is a delightful production of the 1982 off-Broadway musical, which is itself based on the 1960 Roger Corman cult film of the same name. That film was shot in just two days on a budget of $28,000, boasting a young Jack Nicholson as a masochistic dental patient. While the original film was simultaneously campy and horrific, the musical uses the film as the springboard for a more whimsical take on the original story of a hapless flower shop worker who raises a ravenous person-eating plant. The songs add a bit of fun and lightheartedness to the production. After all, it's hard to get too upset when you're only singing about death. The story takes place in and around a flower shop on Skid Row (town undetermined) run by a scrappy, middle-aged and grumpy Mr. Mushnik, played nicely by Warren W. Hardison. Seymour (Morgan Cox), one of Mushnik's employees, has bought an odd-looking plant from a Chinese man during a solar eclipse. He names it Audrey II and puts it in the window to attract customers. This works, and people start to flock to the strange little flower shop on Skid Row, ingratiating Seymour to his disgruntled boss, who starts raking in the dough. Meanwhile, the lovable but tragic Audrey (Jessica Kaufman), a fellow employee after whom the plant is named, is unable to break away from an abusive relationship with a sadistic dentist. We, the audience, of course, root for Audrey and for the dentist's comeuppance — I won't spoil it for you but let's just say the plant, which needs blood to grow, gets bigger and bigger. The music, written by Alan Menken, as well as this production's costumes by Cindy Shepard, are reminiscent of the early 1960s. Howard Ashman's wry lyrics primarily serve the plot; this is not the type of musical that I typically want to learn all of the songs from and sing them in the shower (then again, I have to admit that "Somewhere That's Green" and "Suddenly Seymour" are up there among my favorites). But that's OK; there are other musicals for that. Starting with the stunning three-part harmony in the opening number, sung by a chorus of neighborhood street girls played by Emma Johnstone, Stevy-Alexis Maquez and Jessie Rawson, and continuing throughout the production, the music never disappointed. These performers are the real deal, so much so that at times I forgot I was at a small local theatre. Dell'Arte graduate Lucius Robinson digs athletically into the role of crazy dentist Dr. Orin Scrivello, swinging between scary and goofy at a demented pace. Robinson also plays a number of other minor characters. Kaufman is heartbreaking as the Brooklyn-accented Audrey, with her low self-esteem and her sad and lovely musical numbers. Cox nails the role of the bumbling but well-intentioned Seymour. His singing is outstanding, and he and Kaufman are a perfect match. As for the plant, Craig Woods as the voice of Audrey II is one of the best I've heard. Cecilia Beaton's set and painting by Raymond Gutierrez are great, and designer Dennis Lancaster's inventive puppets grow larger and more lifelike in every scene. Having seen other productions of The Little Shop of Horrors, (movie, live musical, and the 1986 movie-musical), I have to say that Ferndale Rep's is my favorite. The company has brought together some of the area's finest singers, actors, musicians, puppeteers, designers and directors to bring you this fun, campy show. So treat yourself — Halloween month comes but once a year — and go see it. Ferndale Repertory Theatre's Little Shop of Horrors runs Fridays and Saturdays at 8 p.m., and Sundays at 2 p.m. through Oct. 29. Call 786-5483 or visit www.ferndalerep.org. The theoretical physics/literary history romance Arcadia, which manages to charm without prerequisite classes, plays at the North Coast Repertory Theatre on Fridays and Saturdays at 8 p.m. through Oct. 7. For more information, call 442-NCRT or visit www.ncrt.net. Dell'Arte takes a slow boat to drama with Pratik Motwani's piece about an ocean journey of self discovery, The Long Way, playing Oct. 11 at 8 p.m. at the Carlo Theatre. Call 668-5663 or visit www.dellarte.com. More romantic than it sounds, Gruesome Playground Injuries jumps around the timeline of a pair of soulmates. See it at Humboldt State University's Studio Theatre Oct. 13 and 14 at 7 p.m. Call (760) 791-3924.